Designed to fit each model exactly. Does not include a Roller Fairlead. I would only recommend this product if you are only planning to run this as your only accessory. If you are planning to run lights, wiper or heater you will have to go with the Honda Winch Mount Kit as it has everything needed to install your winch with added accessories. Kinda speedy for what it is but quality is there. Bolted right up and works great. I installed this on a 2009 King Quad 750. Fit was perfect and installed in minutes. Installing is easy and painless. Hardest part of installing a winch is the wiring. Would buy again for any utv i purchase. Easy to mount and puts winch cable at a good angle. Seems very sturdy with thick metal. Everything lined up great. Works great but I have broke cable a couple times when using the snow plow and lifting the blade up and down. If you want a blade it is best to put both mounts on at the same time. I did winch first and had to remove some of the bolts on winch mount to install blade mount. Placed my order and 2 days later it was on my doorstep!! All bolt holes lined up perfectly, didn't have to make no adjustments. The quality appeared to be top end as it was made of heavy steel that was powder coated, it should last the life of my machine. I am very satisfied and would definitely recommend this product and Rocky mountain ATV/MC!!! This bracket works well with the Warn Pro-Vantage, however, the folds interfere with the sides of the winch base which make it necessary to use a spacer plate, and they come with it. and the four holes were drilled too far to one side that the winch mounts to. they will all need filed about a half of a hole width in order to get proper alignment to start all four bolts. Love the plate. Fits great! Expensive but fits perfectly for my 2016 Honda Pioneer 1000-5. This mount was made for my specific vehicle and fit perfectly. Well built and strong, just be sure that the bolt pattern for the winch itself is correct. Perfect fit, semi beefy, easier than making one. I used on a 2015 Grizzly 700. works great and was easy enough to install. This mount was a perfect fit for my rzr 900xp. The install was very easy. The Warn winch mount for specific for. Y atv fit perfectly and was super easy to install! Everything lined up perfectly! I bought this winch plate for my grizzly 350 primarily for use with my snowplow but have also found it useful in mud pits. Product was very easy to bolt up without having to drill out the holes. I didn't want a winch hanging off my front bumper. Warn's solution is top notch. Well hidden, but if you have a stock front bumper, you will need to cut out the center tube for good winch line clearance. This looks better and is less expensive than OEM. A pleasant surprise that it included the long cables that hookup between battery and relay switch. Everything was shipped FAST and in excellent packaging. Very impressed with Shipping time. Everything fit perfectly. Excellent Product! Be prepared to be patient though. Two sets of hands are recommended. Everything will fit perfectly but you need to give yourself a few hours. Do it when you aren't in a hurry. I called to make sure this part fit just in case. The mounting plate install was super easy. I think it took about 15-20 min tops. I am very happy with my order and will be back to order more parts soon. Fit perfect and is heavy duty. I order a plate for a 2014 Rzr 1000 and on the instructions, the manual states that the plate is for a 2013 Rzr 1000. Still fit the 2014 like a glove. Install was a breeze. It is also a great plate to install a winch other than Warn. Just drilled four holes and winch went on smoothly. Installed this winch with very little struggle. Takes some time because you have to take off the front fairing and brush guards if you have one. Otherwise fit perfect and looks great. Highly recommend. The mount fit perfectly and the install was very easy. Great fit. I had to trim a corner of the the plastic belly pan for final install, but very easy to put together. Winch mount was great. Needed to expand the upper support bracket but other than that it worked great. Plate sent for the winch contactor didn't work with the supplied part from warn. Looks like design changed. Little modifying and another hole drilled and it works. Great product, easy instructions and all the hardware was included. The instructions tell you how to put on the plate, add the winch, run the wiring and has lots of pictures. The fairlead that I bought bolted right onto it and everything looks like its supposed to be there. winch mounting plate had to be redrilled. The motor on the winch comes in contact withe the radiator guard using the holes provided in the winch mount. I had to drill new holes 1-1/2" to the right to get it to fit. Otherwise seem to be a good unit. Great fit, thick metal, shouldn't have any worries with this part. This Winch mount fitted up perfectly as if it was an OEM product. RMATV sent it out to me in Australia promptly, arriving in just a few days from ordering. fantastic service. Thanks Guys.... keep up the great work. this plate is heavy and fits great! no modding and it fits great and is heavy!!!!!! Machine this part was bought for: 2014 POLARIS SPORTSMAN 400 H.O. Now that its on its great. Putting it on is another story. Needs better pics in the instructions for this particular machine. No issues other than that. Well built! BEST ANSWER: The one that i had was installed by the dealer which was "for a warn winch" but wasnt warn brand, so it didnt have the two wide spots i assume you're talking about. so yes you need to buy the other one. the picture in the instruction was different than the one i had also. I also went back and forth with customer service trying to figure this out, sending pics etc. I feel i should say RMATVMC has great customer service! will a PV4500 fit in my 2004 Big Bear ? replacing a weak 2500 warn. BEST ANSWER: No there "designed to fit each model exactly" as it says in the description. You will have to find the part that matches your model of machine. Will this work for a 3500 lb badland winch? BEST ANSWER: A's long as the Badlands winch has a 3" X 4 7/8" mounting bolt pattern and there is room on your ATV to mount it, it should work. I know the 3500lb Warn I mounted on my Sportsman 570 was a tight fit. Does the warn winch mounting plate come with all hardware? BEST ANSWER: Yes, it comes with all the needed hardware. Is this just to mount the winch or does it mount the flair lead too? BEST ANSWER: It comes with another plate and longer bolts to mount the flair lead to it or you can mount it to the front by the bumper on a bracket that comes with the winch I think. I believe it is just the plate to mount the winch to, it was on my 07 Grizzly 660 anyway. I have a 2011 grizzly and the flair lead rollers bolted right up to the plate as well. It mounts both the winch and fairl lead, fits great and included all needed hardware. It also mounts the fairlead and the solenoids if you wish. will this work for any winch not just warn or does it have to be a warn winch to fit? BEST ANSWER: The instructions that come with the mount say to only use the Warn 4000s. I think that the "s" which stands for synthetic rope is important due to the rope passing over two rollers and hard cable tends to destroy the rollers and the cable life is shortened as well. Otherwise, I think that any winch that fits the bolt pattern and inside the chassis would work. It fits pretty tight in the Wildcat frame between the steering cable and other stuff. Can't say it will fit all Winches but I have used for Warn and for a Viper winch. It has multiple holes for a few options. I believe it's just Warn only. Haven't seen one that was universal made by them. will this plate work with the warn vrx 45 winch? BEST ANSWER: What mounting plate are you referring to? If the mounting plate is the same part# that I ordered (1038350528) then it should fit. Make sure not to tighten any bolts until the plate is in place. Otherwise you will struggle to to get it correct. Does this winch come with all the wiring and installation instructions to install it? Also will this mount plate work for a 2012 Kawasaki brute force 750? BEST ANSWER: The winch plate was very easy to install and the wiring was easy to install on my 2015 Yamaha Viking as the battery was just above the winch mount. Just a few normal tools were needed. Not sure about your application. Very easy and works great. Yes this winch comes with all the wiring and installation instructions to make this install as easy as possible. And that winch mounting plate will work as long as you are sure to specify your machine when ordering it. Yes, it comes with the installation instructions. The mount plate, that comes with the winch, will work. However, slight modification may be needed for proper fitment. I have a traveller brand 3500lb winch. Is it the same bolt pattern as the warn winch? BEST ANSWER: You know I'm not familiar with that brand winch as I have only used warn winch products on my trucks and atv's for the last 40 years. However, the good thing about these plates is the ability to drill new holes in them to make it work. Hope that helps some. Happy 4 wheeling and be safe. Mike. Yes it is ..Warn winch plate has several different type of bolt patterns in it. One is bound to fit. I had two different type of winches on that plate already 1 winches from Harbor Freight think the other one is from Travellers 3500.
no , defferent bolt pattern.Have to mark and drill new holes. Does the warn wench plate fit the stock front bumper on the Honda 500 Pioneer ? BEST ANSWER: Don't know Mine went on RZR 1000 XP but I'd bet they have one that fits. Mine was for Honda 1000 and fit without any problems. will this fit a 05 wolverine 350 4x4 ? BEST ANSWER: I doubt. They are specific to the 2016 and on 700 Grizzlys. Will this winch mount work with a Warner Provantage front mount plow system? BEST ANSWER: Michael, I purchased the mount for my UTV and it was very universal and fit my Yamaha Viking VI without a hiccup. Hope this helps. work on my 2019 Yamaha wolverine R-SPEC with axon 3500lb winch? What is the winch mounting holes spacing 3 x 6.59? BEST ANSWER: I’m not sure right offf hand. I’ll see if I can measure it when I get back. will this work on a 2014 1000x wildcat limited ? 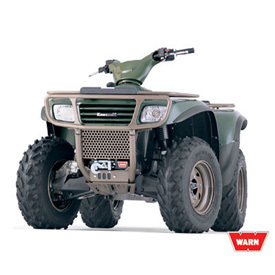 I have a Vantage 4000 Series 4000 lb and want to install on 2014 wildcat x. Is this the correct mount for under the hood location? BEST ANSWER: Hi Jeff, I can't speak to the mount on the Wild cat, as mine was for a 2008 Polaris RZR. however if it is from Rocky Mtn., you can pretty much bet it is the right one. If not, their return policy is second to none. On the RZR there were some tight spots to fit the fasteners, but it all went together as it should. Hope this was at least a little helpful. Good luck. I have a Warn Vantage 4000 lb. winch. I want to put this on my Polaris RZR 800 XC. Will this plate work with my 2014 Polaris RZR 800 XC and will it work with the Vantage 4000 lb. winch? BEST ANSWER: This will fit on your machine. However, this mount plate will not work with 4000 lb winch. is this warn part 8470az? BEST ANSWER: This is not. This is Warn part's number 87987.
i have a honda 300 four trx 1988 is there a winch mount i can buy for it? Will it fit a 2007 Honda Rancher?